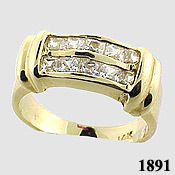 Solid 14k yellow Gold... Princess Cut CZs... Double Row, 10 stone, Anniversary Ring... 1/2 Carat, Gorgeous, Top Quality, Russian CZs!!! Looks/fits Great with a standard solitaire ring!!! Emaculate Workmanship!!! Nice! Popular style!